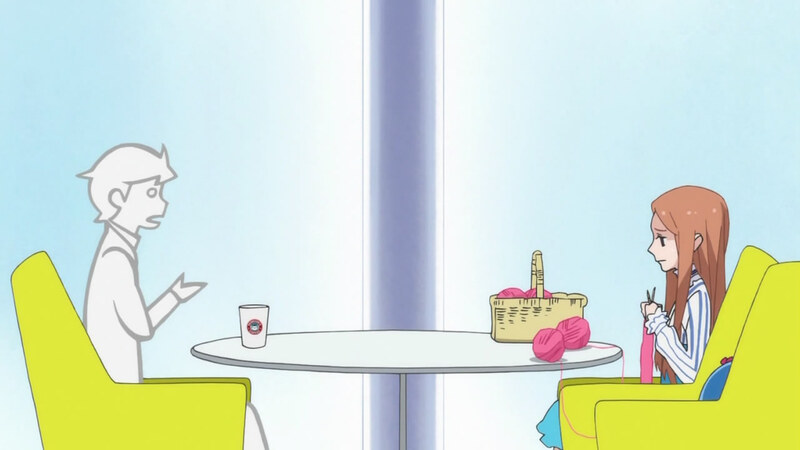 Penguindrum 10 - Pink Sweater time! 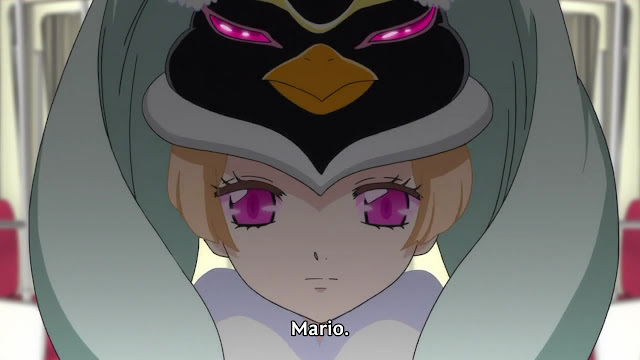 Another episode of Penguindrum to deepen the plot. We finally get to see a new mastermind behind everything, even if it was very brief. An action packed episode, it has been a while since the plot picked up so much. 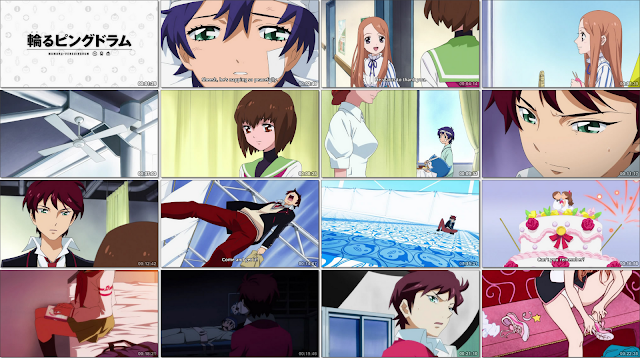 Then again, it is being compared to other shows ramping up for their finale.This has gotten me back into Penguindrum Thursdays that has had slowly waning interest these last few episodes. I hate the obvious pairing they are setting up for now. Ringo is starting to fall for the blue hair twin so that Himari will be free for the red hair one to grab. Ringo and blue hair just don't go together to matter how many awkward situations then been put through already; Ringo deserves better. Funny how slow red haired brother was to pick up his mistake. Typical answer from a playa though. 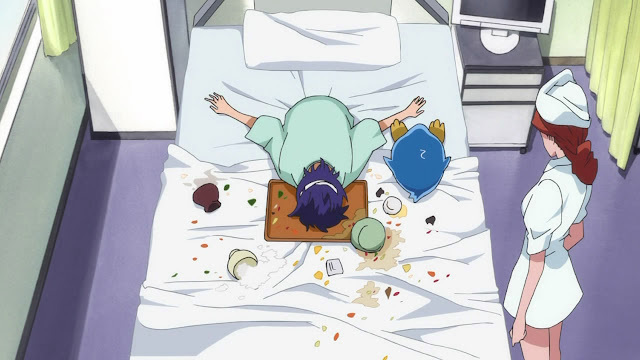 He only had like a nibble of that pudding and still fell over? How weak is he? Way to end up being bait. 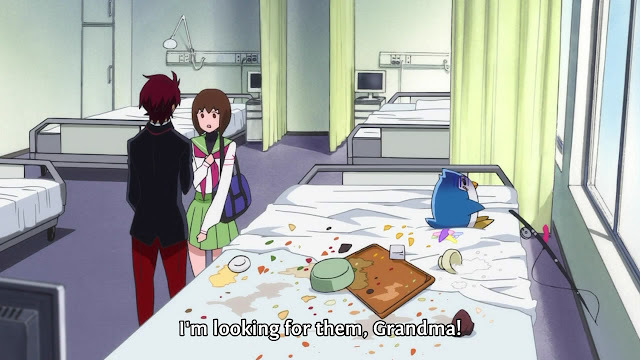 After Ringo being pro for so many episodes with her stalking skills, how did she lose him so easily? Power balance needed! Why was the blade sharpened if they were just threatening without action? So many random questions about things that don't matter! So things are a bit more clear now, she is Ringo V2.0. Way to upgrade your stalker to the next level as the next character to focus on. She clearly was red-hair's past lover. It explains why the group of ex-girlfriends were assembled in the first place. I hope we get at least a short flashback to see how badly she stalked him. I mean, she made quite a few things for him that he all named earlier in the episode as horrible gifts. It must have been a fun relationship. So their are multiple magic hats? With the appearance of another new character, I am thinking their situation will end up being similar. This second hat user is being kept alive by the hat and the girl is forced to do his bidding. So we learn later their is a secret penguin hat war that we know nothing about! A power struggle to own the magic diary. I am thinking the dead sister has much more to do with this plot then what was shown so far. All just speculation from me for now. Penguins need to be pro fishers to survive! So they keep introducing new elements leaving you what is coming next. The anime is still not as fast paced as I prefer, but I still like it. The penguins doing random things while they talk is still the biggest plus for me, at least we don't need to stare at background or random closeups while they talk. The penguins just bring everything together in this show.